"Strand SPA & Conference Hotel" offers fine accommodation coupled with beautiful views of Parnu Bay. Hotel rooms and the hotel building itself have been renovated continuously, lastly in 2011. All hotel rooms, conference halls, the restaurant, the spa, the wellness center, the indoor mini golf course and the nightclub have been planned with thorough consideration and furnished with good taste. 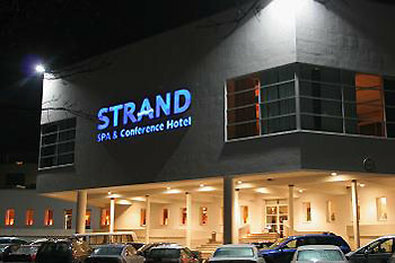 Strand SPA & Conference Hotel has 187 comfortable rooms, most of them with a beautiful view of the sea. Even the most demanding client can find suitable housing among the presented options - family rooms, luxurious suites, hypo-allergenic rooms and rooms for guests with special needs. Pets are welcome. All rooms are non-smoking. The in-room amenities include air conditioning, TV set, telephone, coffee and tea making provisions, hair-drier, robes, mini bar, Internet access. The room price includes an abundant breakfast, spa visit during the hotel stay, and entry into the Strand nightclub. Strand SPA & Conference Hotel offers high-quality comprehensive solutions for organizing conferences and events. It combines a range of services, conference rooms and multi-purpose conference hall, featuring Wi-Fi Internet, air conditioning, data projector, paper board and screen. TV and video are available upon request. Delicious meals, tasty coffee breaks and grand dinners will fill the participants with enough energy to see the successful conclusion of any event. The hotel's 160-seat a la carte restaurant carries the trends of a classical European cuisine where natural and healthy ingredients offer choices to different preferences and wishes. Guests are welcome for business lunches or enjoying a tasty summer selection with family and friends. On top of that, the hotel provides the following facilities - spa and wellness centre, fitness hall, swimming pool, nightclub, billiards, beauty, secured parking and many more.